Before proceeding with the review of this supplement, I should say a few words about the core game. Fate of the Norns: Ragnarok is a game about Viking myth. The setting is Midgard during the time of Ragnarok, the Viking end-times. Ragnarok is a cataclysmic series of events inaugurated by the eating of the sun and the moon by wolves and the resulting onset of the perpetually dark Fimbulwinter. Ragnarok will ultimately end with a great battle and a rebirth of the world into something new. Characters include warriors, craftsmen of renown, spell-casters, and seers who ultimately hoped to get picked by one side or another for this cosmic final battle. They do so by trying to make a name for themselves in mythic, night-ridden Midgard. Fate of the Norns uses a unique and very creative mechanic that hinges on the pulling of runes from a bag as the randomizer. It's extremely flavorful, and really quite fun. The result is a medium-crunch, tactile game for traditional play that is quite unlike anything else. 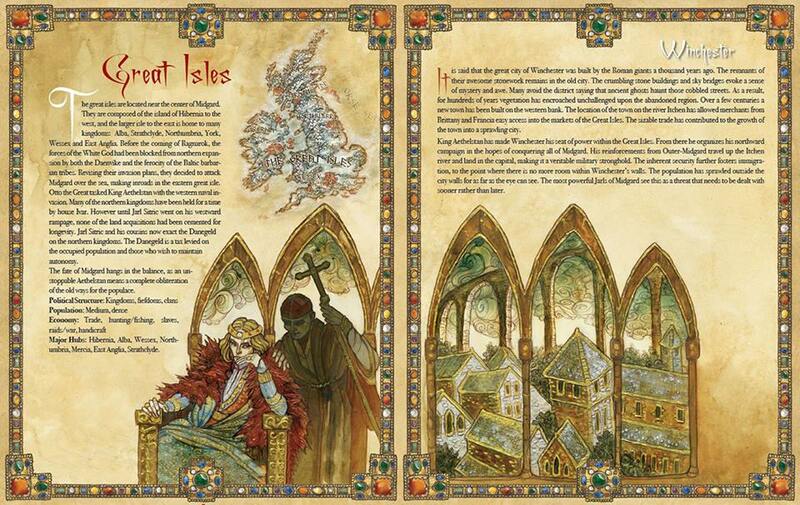 The physical book also has a certain wow-factor because every page is a piece of art - it's very stylish. Now - on to the review. Denizens of the North describes itself as a "Lore Book." Think of it as the GM's companion to the core game. it looks and reads very much like an expansion of the core rule book. The quality of the art, writing, and layout are more of what you would expect after having read the core book. A few vocal people complained that the core book used Arial as a font – if you were one of those you'll be happy to know this book uses a serif font. Introduction: A brief description of Midgard and first two Ages of Ragnarok (Axe Age & Sword Age) 2 pages. Legends and Villains: Prose descriptions of 36 historic and mythic personalities - the people of power in the setting. 84 pages. Magic Items: 52 Objects of myth and legend of varying power described and statted for your use. 20 pages. Denizens: "Denizens" is FotN code language for NPCs. This section is basically a collection of new monsters/enemies with stats. 72 pages. Viking Life: Short essays on various aspects of viking life to supplement what's in the core book. 16 pages. Skraelings: Arctic natives of Greenland and Vinland are briefly described here. 5 pages. Norn Rules: "Norn" is FotN-speak for the GM, so this contains some new rules and clarifications to existing ones. 22 pages. New Lifepath Tables: To be used for fleshing out starting characters - these are super. 6 pages. Starter Vignettes: Nine scenario briefs that a Norn could develop into scenarios or a campaign. 31 pages. Updated Equipment List: 1 page. Dwellers: "Dwellers" is FotN-speak for Characters - here are six starting characters, one for each new archetype. So, what's good about this product? This book mainly contains more of what you already saw in the core book, which makes it a useful companion. I'm not really someone who goes in for "more rules" - in fact, if more rules are a selling feature, I usually turn the other way. Same goes for "more spells". If that was all this book had to offer I would have been disappointed. But Denizens really does offer a smorgasboard of material; it's not just more fermented shark. The best material are the new classes, new monsters, and (my favourite) the Lifepath tables, which I thought we quite brilliant. Some of these (the table that determines how two characters know each other and relate to one another) could be used for any game. I also really liked the 'brushes with fame' table for integrating new denizens into the setting. Also strong are the legendary figures (major NPCs), which are all interesting and quite varied. These include Weyland the Smith, Constantine the Pict, Vainamoinen, Eric the Red, Drifa, Queen of Svalbard. and many historic figures. These tie in very nicely with the Vignettes at the end of the book, and reading all these one can see how a grand campaign could be created where the PCs get caught up in the machinations of these figures. This book doesn't go quite as far as I would have liked in this regard, but after reading Denizens of the North I really did get a vision of Midgard as a very Game-of-Thrones-esque setting, and that's not something I really got from the core book, so it's safe to say this companion has changed my perspective on the setting and how I would construct a campaign for it. These rest of the content is less interesting, in my view, but the new powers are really there to serve the new monsters and PC classes, so they have their place. What's missing from the book are stats for major NPCs listed in the Legends section and in the full scenario (level and archetype are given, so a GM could stat them up on his own, but I really would have preferred someone else to do this). Also, the organization of the text is rather odd. It jumps right into to describing the people of legend without much context, and follows this up with descriptions of the kingdoms (which really should have come first). The text could also use some help contextualizing everything - giving the GM advice on how to fit these various bits together. It could have used another edit with an eye to making the material more accessible to tyros like myself. Overall, this is a useful addition to the line, and I think it would be a valuable tool for anyone who plans to run a FotN campaign. You don't need this book, but you'll get something out of it if you're a fan of the system and setting. The book might also be useful to people who want to set up a game in any system using legendary characters because it gives you personalities, plot seeds, items of myth, and some great lifepath tables that could be used with any system. One final word - although this book is big, and seems really long for a companion at 420 pages, the text is 12 point and only occupies a small part of most pages, which allows you to enjoy the illustrations that adorn each page. Score: 3 out of 5. This supplement us useful and fun, but not necessary. Also somewhat disorganized and some elements are lacking in context. Another edit would have helped.